This chapter provides some examples from the literature of how feed-forward neural networks are used in three different contexts in manufacturing operations. Operational design problems involve the determination of design parameters, such as number of kanbans, in order to optimize the performance of the system. Operational-system decision support refers to the use of neural networks as decision-support mechanisms in predicting system performance in response to certain settings of system parameters and current environmental factors. Operational-system-control problems are distinguished from decision support in that the consequences of a control decision are both an immediate return and putting the system in a new state from which another control decision needs to be taken. In operational control, new ideas are emerging using neural networks in approximate dynamic programming. Manufacturing systems can be very complex. There are many factors that may influence the performance of these systems; yet in many cases, the true relationship between these factors and the system outcomes is not fully understood. Neural networks have been given a great deal of attention in recent years with their ability to learn complex mappings even when presented with a partial, and even noisy, set of data. This has resulted in their being considered as a means to study and perhaps even optimize the performance of manufacturing operations. This chapter provides some examples from the literature of how neural networks are used in three different contexts in manufacturing systems. The categories (1) operational design, (2) operational decision-support systems, and (3) operational control are distinguished by the time context within which the models are used. Some examples make use of simulation models to produce training data, while some use actual production data. In some applications, the network is used to simply predict performance or outcomes, while in others the neural network is used in the determination of optimal parameters or to recommend good settings. 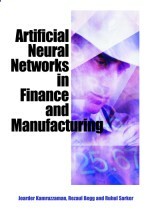 Readers who wish to explore further examples of neural networks in manufacturing can examine Udo (1992), Zhang and Huang (1995), and Wang, Tang, and Roze (2001). We begin with two areas in which neural networks have found extensive use in manufacturing. Operational-system design has seen considerable use of neural networks as metamodels that can stand in place of the system, as we attempt to understand its behavior and optimize design parameters. Operational-system decision support refers to the use of neural networks as decision-support mechanisms in predicting system performance in response to certain settings of system parameters. We close with a short introduction to an area where we anticipate seeing growing numbers of applications, namely the use of approximate dynamic programming methods to develop real-time controllers for manufacturing systems.